The National Restaurant Association (NRA) annually explores the top menu trends for the coming year. 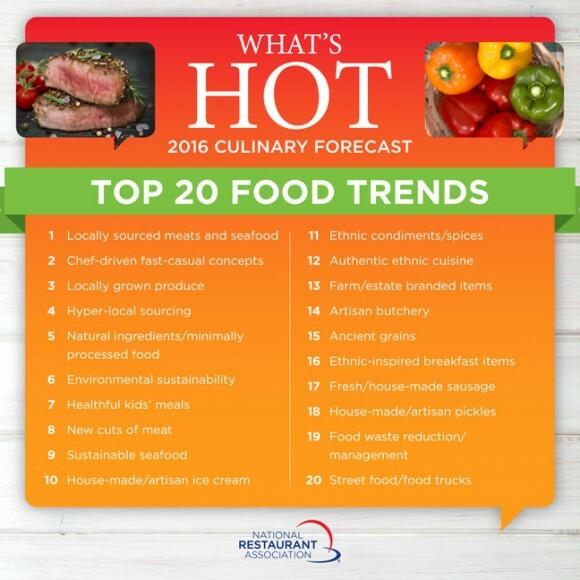 For this year’s “What’s Hot” culinary forecast, the NRA surveyed nearly 1,600 professional chefs—members of the American Culinary Federation (ACF)—to find which foods, beverages and culinary themes will be hot on restaurant menus in 2016. For complete article, including other survey results, additional trends to watch, a video and downloadable graphics - click here.